This entry was posted on Sunday, July 3rd, 2016 at 5:00 pm	and is filed under app notes. You can follow any responses to this entry through the RSS 2.0 feed. You can skip to the end and leave a response. Pinging is currently not allowed. Well that’s a bit of a lame summary. The audio-amplifier crowd have a habit of using large toroidal transformers that suffer huge inrush (both magnetisation current and charging up a huge filter C). They tend to use a high power resistor shorted by a relay that closes after 100ms or so. Very soft start, with the only long-term power loss being the relay coil. NTCs provide no protection for warm starts, and they’re pretty inefficient anyway because they have to stay warm! If you have a power bump – the typical 500ms dropout that happens when the distribution network changes over to a backup feed – then you’ll find out why warm-start matters for things like toroids. You also have to be sure that the control system has fast dropout, i.e. is capable of detecting all power losses longer than about 2 or 3 cycles. Agree, Aimtec’s app note should have “with passive devices” appended. Rather short for an app note, a bit lazy there. It also matters for anyone who is powering devices (even small ones) over long cables, because cable L + input C = 2*Vin spikes that can blow up the downstream power supplies. 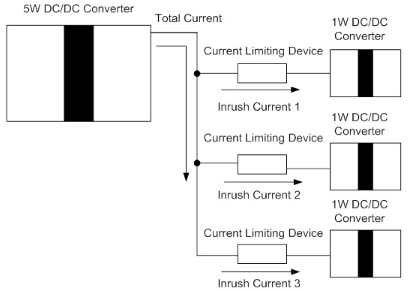 So overcurrent is not the only problem: inrush can cause overvoltage. PFC is the ultimate inrush limiter!